Christine Molloy and Joe Lawlor originally met in Dublin in the early 1980’s and began working on community art programmes and have spent the last few years writing and directing a series of short films collectively known as ‘Civic Life” Each film being shown in the community where it was made and cast. Reaching a wider audience when their short Who Killed Brown Owl won an award at the 2004 Edinburgh International Film Festival. Four years later another of the series of films, Joy won the Prix UIP at Rotterdam. Joy is the companion piece to their first full-length feature film Helen (2008). Shot in Newcastle, Liverpool, Dublin and Birmingham Helen (Annie Townsend) is a parentless young teenager who is alienated from society, a product of an institutionalised care system. On a bright autumn day in a public park a young girl wearing a bright yellow leather jacket leaves her group of friends to walk alone into a wooded area, Joy is never seen again. The police, who assume she has been abducted, arrange a reconstruction of her last movements. Helen, who closely resembles the absent girl, is chosen for the role. She quickly becomes absorbed in Joy’s life and takes on her personae including spending time with the grieving parents in their home and obtains her first kiss from Danny, the missing girls boyfriend. Our Dublin based directors, as with the previous shorts, used local non-professional low-key actors to deliberately give a sense of truth to the narrative, a strategy that works extremely well. 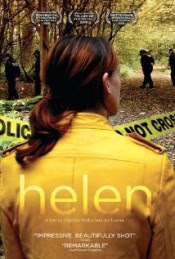 As does the use of colour, the bright yellow jacket that we first see Joy wearing on the day she disappeared and consequently Helen wears for the reconstruction, the red uniform Helen and another worker have on when working part time at a hotel and the autumnal colouring in the public park. This low budget emotional study of loneliness and despair permits Helen to discover hidden depths and contemplate a future, it also gives a glimpse of the personal anguish experienced by grieving parents. Authentically inspiring, a film that allows the audience space to think about what they witness on screen.